Hello everyone! Summer is not over yet and some are already preparing for school (I know I am, preparing my classroom). 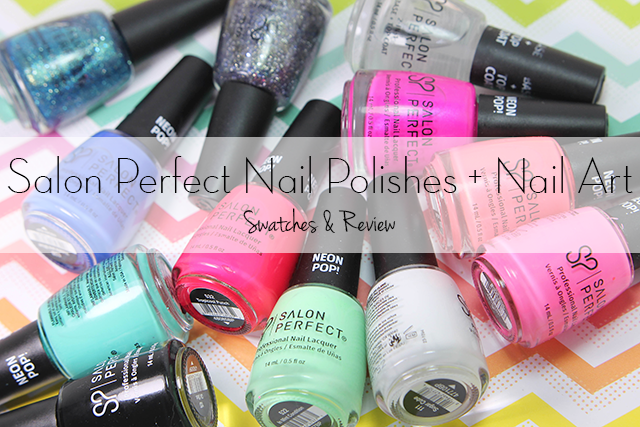 For today's post I have a review from a new-to-me brand Salon Perfect Summery nail polishes. Now I've seen and heard of this brand before, which are sold exclusively at Walmart, I was pretty excited to have the chance to try them myself. Sugar Cube- is pure white creme. Now this is one of basic colors I love having no matter what. It's a white creme that pairs perfectly with neon's. It's opaque in only two coats, but you do have to be careful when applying because it could get slightly streaky. This is two coats sealed with top coat. Oil Slick- pure glossy black creme and another basic colors definitely needed. I'm so impressed with the formula it is a dream, very creamy. The application was absolutely amazing, smooth like butter! You definitely can get away with a one coater, however for the swatch I applied two coats sealed with top coat. 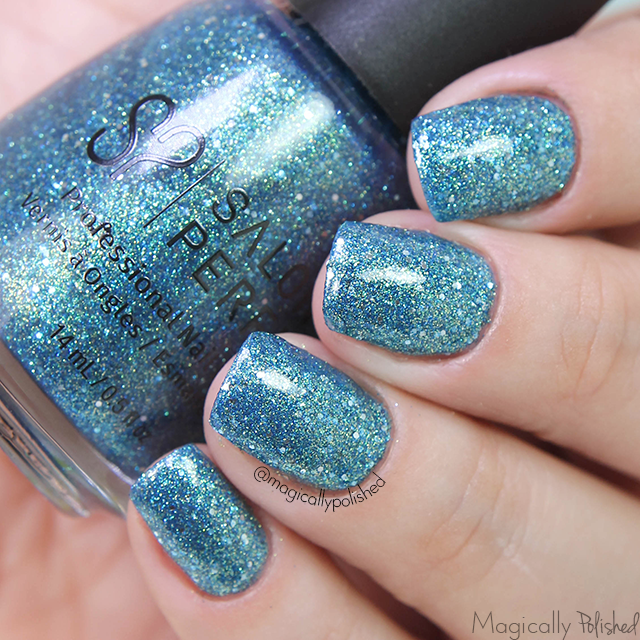 Siren Song- is a turquoise jelly packed with tight with green, blue and sliver glitters throughout the polish. Formula on this polish was pretty good and applied perfectly. Covers the nail in one coat with a black base, and two coats sealed with top coat. 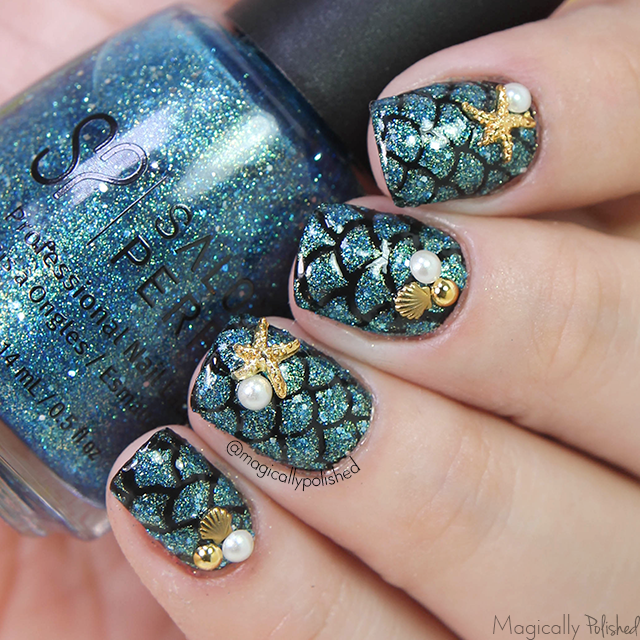 For this look, I wanted to create these mermaid nails using some nail vinyls I hadn't used in a long time. For the base I used two coats of Oil Slick. 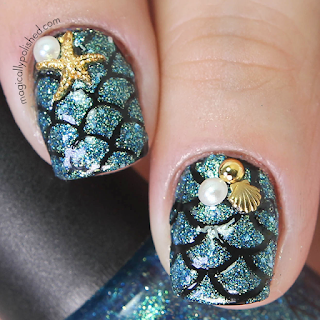 Once that was completely dried, I then used mermaid nail vinyls from Whats Up Nails and Twinkled T and applied Siren Song over the nails. 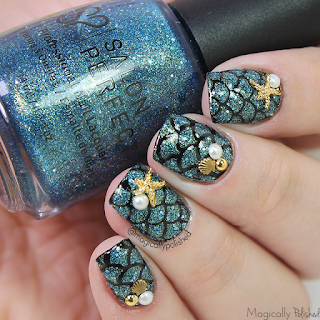 Once that was set I then added a few pearls, starfish and seashell studs, to finish the look. Sealed with 2-in-1 Base/Top Coat. 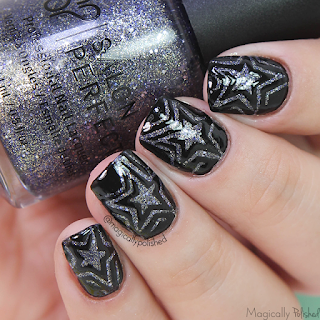 Faraway Galaxy- is a dark blue jelly packed with tight with black, green/gold and sliver glitters throughout the polish. Formula on this polish was pretty good and applied perfectly. Covers the nail in one coat with a black base, and two coats sealed with top coat. For this look I decided to keep up with the theme and decided to use another vinyl to create this design. 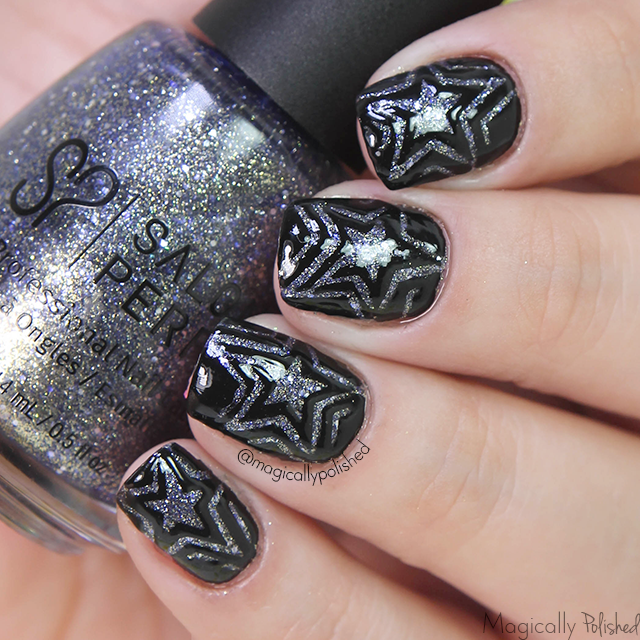 First I applied two coats of Faraway Galaxy and let it dried. Once that was set I then added Bundle Monster nail vinyl star cyclone and then applied one coat of Oil Slick. I then sealed the design with top coat. Mer-Made of Money- is a bright turquoise neon creme. I absolutely love this color goes perfectly, with any color on this collection. The formula on this polish is pretty good. I had no problems with streaking or staining at all. This is two coats sealed with top coat. Burst Your Bubblegum- a gorgeous neon pink creme and a favorite of mine. The formula on this polish was great, it has a really nice consistency and it flowed nicely onto the nail. I used two coats, sealed with top coat. For this look I wanted to create a summery design using two of my favorite colors: Burst Your Bubblegum and Mer-Made of Money. For the base I created a gradient with a make-up sponge using the two colors. 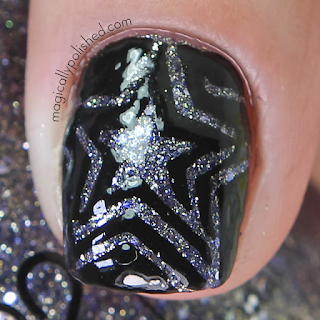 Once completely dried, I then stamped a fun geometric design from Bundle Monster Psychodelic Haze with BMC Angelic White. 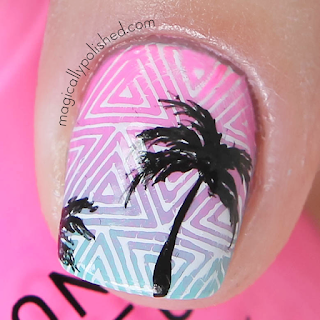 I then freehand a few palm trees to make it pop (which I love!) and sealed with top coat. Violets are Blue- is more or a less blurple neon blue creme. It does have a slight purple undertones.The formula on this polish was impressively good and you get away with one coat. However this is two coats, sealed with top coat. Tropicool Punch- is a neon red/pink jelly. The formula on this polish is exceptionally good. I had no problems with streaking or staining at all. Although you may get away with one coat, this is two coat sealed with top coat. Back to Fuchsia- is a really pretty neon fuchsia creme with subtle of purple shimmers throughout the polish. The formula on this polish is pretty good. I had no problems with streaking or staining at all. This is two coats sealed with top coat. Lets Not Coral- is a coral creme with a hint of pink undertones and subtle of shimmers throughout the polish. The application was absolutely amazing, smooth like butter! You definitely can get away with a one coater, however for the swatch I applied two coats sealed with top coat. In Mint Condition- is a neon green creme and another favorite of mine. Very impressed with the formula it is a dream, very creamy. The application was absolutely amazing, smooth like butter! You definitely can get away with a one coater, however for the swatch I applied two coats sealed with top coat. Neons are one of the hardest to photography, but I think these turn out perfectly. I also did no use a white base for any of the swatches. Overall I am very impressed with Salon Perfect polishes and their beautifully unique colors. Their formula requires minimal coats, which makes the application easier and fast drying with a glossy look. You can purchase on their website here for $3.98 each or exclusively at Walmart (pricing depends in your location). Connect with Salon Perfect: Facebook | Twitter | Instagram | YouTube | Pinterest Hope all of you enjoyed my post today! What do you guys think? Let me know in the comments below!